Ideally located in heart of Orlandos attractions area, Magical Memories Villas offers convenient access to all the local theme parks. 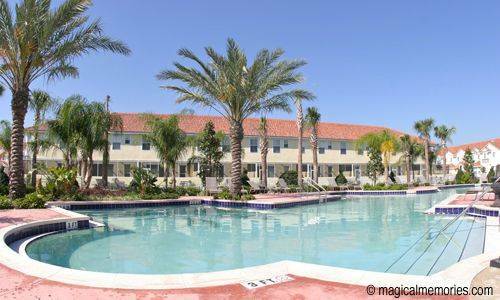 These villas and condos are situated within minutes of Walt Disney World®. SeaWorld®, Universal Studios® and Islands of Adventure®, restaurants, shopping and nightly entertainment, including dinner shows, can also be found within a short drive including Pleasure Island and City Walk. In addition to local attractions and luxurious accommodations, Magical Memories Villas will provide you with all the amenities and services you need for a smooth and relaxing vacation, giving you a haven from your everyday stress. With villa or condo style living you can enjoy all the amenities the clubhouse has to offer - amenities include; game room, gym, swimming pool, Jacuzzi and tennis court. 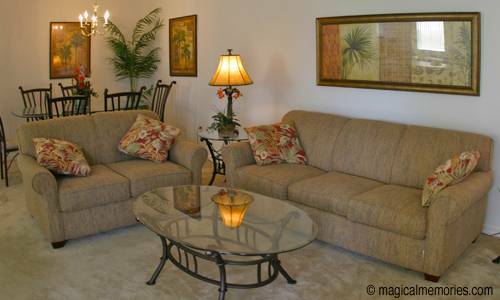 Magical Memories Villas /offer the coziness and privacy of home, with room to relax. 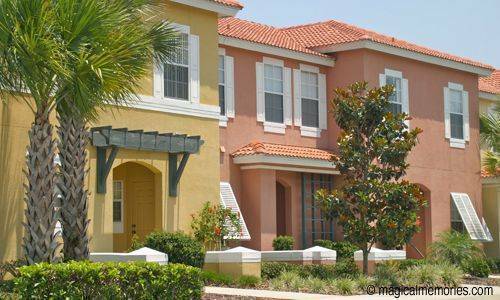 Beautifully appointed villas and condos provide everything you will need for an extraordinary vacation in Central Florida, from the comforts of home to first-class amenities to prime locations near the Walt Disney® World Resort Area, at a price comparable to an Orlando hotel. 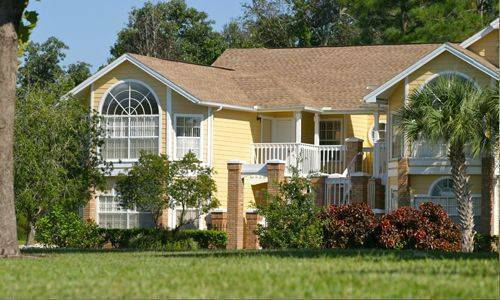 The combination of amenities and services will enable you to make your vacation in Orlando the trip of a lifetime! Two Bedroom Villa - Sleeps up to 6 people and offers 2 full bathrooms, a living room, with TV and DVD, dining room, full kitchen and in-unit washer and dryer. This unit offers a queen in the master bedroom, 2 twins in the second bedroom and a sleeper sofa bed in the living room. Three Bedroom Villa - Sleeps up to 8 people and offers 2 full bathrooms, a living room with TV and DVD, dining room, full kitchen and in-unit washer and dryer. This unit offers a queen in the master bedroom, a full or two twins in the second bedroom, two twins in the third bedroom and a sleeper sofa in the living room. Reservations must be cancelled forty eight (48) hours prior to guest arrival. Any reservations that are not cancelled within this time frame or are a No-Show will be subject to a fee of one nights room and tax. 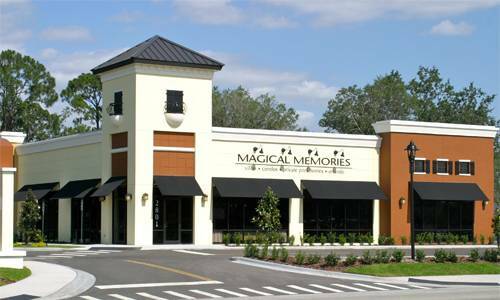 Magical Memories Guest Service Center (Check-in/Check-out Office) is open daily from 8:00am - 8:00pm. If arrival time does not correspond with these hours, please see After Hours Check-in Procedures. Check-in time is 4:00pm / Check-out time is 10:00am. Units cannot be guaranteed or be available prior to the above mentioned times. Magical Memories Guest Service Center (Check-in/Check-out Office) is not open 24 hours per day. All guests must receive After Hours Check-in Procedures before arriving. All guests that have not arrived at Magical Memories by closing time will find directions and keys to their accommodations in our after hours lock box. There is a three (3) night minimum stay for a villa. Florida Fire Codes allow up to six (6) people in a two (2) bedroom and eight (8) people in a three (3) bedroom. Incidentals: Upon Check-in guests will be required to leave credit card imprint or two hundred and fifty dollars ($250.00) cash on deposit to cover any damages, losses and/or extra time cleaning/repairing the unit from the result of their stay. Pet Policy: Pets are permitted only in certain units. Request must be mentioned when booking reservation. A Non-Refundable Pet Fee of fifty dollars ($50.00) per pet for a Villa or Condo and seventy-five ($75.00) for a Vacation Home will apply and must be prepaid. Maximum number of pets allowed per unit is two (2) and each pet must be under twenty-five pounds (25lbs). Crib: Cribs are available upon request at no additional charge. Request must be mentioned when booking reservation. Turn left onto Route 535 and continue to S. R. 192 (Irlo Bronson Mem. Hwy). Turn right onto S. R. 192. At the next light, which is Poinciana Blvd, turn left. Our office is 2801 North Poinciana, next to the Fun Spot Hotel (Former Ramanda Inn).